John and Julie perform public and private engagements and conduct song-writing workshops around the country. You may contact them for details at any time by email or calling them. See a profile on John featured in Bluegrass Today. See an interview with John on Lilly Drumeva’s blog. Listen to the 2015 podcast of John and Julie’s visit with Martin Gilmore at Swallow Hill talking about songwriting in the modern world, performance and The Beatles. NASHVILLE – When they met, appropriately at a Bluegrass festival, it was the beginning of a story that has already resulted in dozens of radio-friendly songs, an ever-increasing number of concert and festival appearances which have delighted fan bases both in the USA and Julie’s native Canada, a music room in their Nashville home that includes over 25 instruments, and not to mention two adorable little girls. As a pair, the married couple of Julie & John Pennell are truly one of Nashville’s most harmonious and engaging duos. 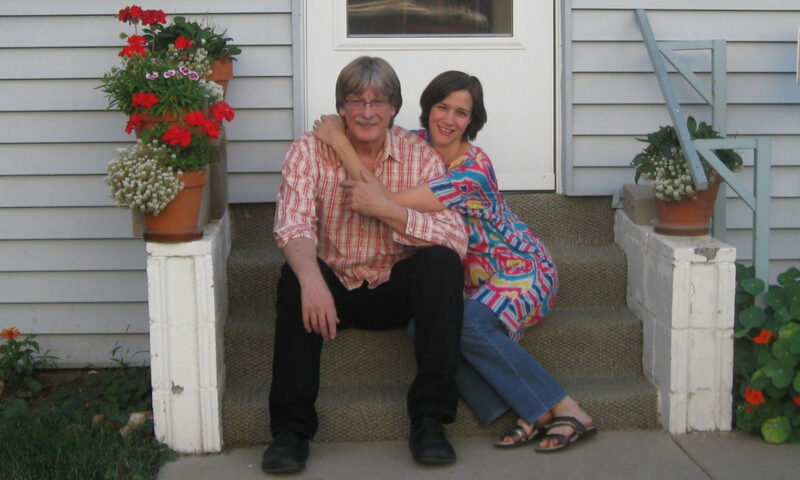 The recent boom in acoustic, Bluegrass, and folk music comes at an ideal time for Julie & John Pennell, who have lived, breathed, created and performed that kind of music since they were growing up, he in central Illinois and she in North Bay, Ontario. Long before the couple met, John began playing upright bass for another remarkably talented Illinois product who was soon to become a multi-platinum star: Alison Krauss. Alison recorded several John Pennell compositions that have become longtime concert favorites of hers including “Jacob’s Dream,” “Too Late To Cry,” and the title track of her fourth Rounder album, Every Time You Say Goodbye. Eva Cassidy, Alan Jackson, the Infamous Stringdusters, and the 14-time Grammy-winning Dan Tyminski all have cut John’s songs. He has also worked as an upright bass player for Krauss, Vassar Clements, and many more stars, including the late, great Harley Allen. Harley, who passed in 2011, was John’s best friend. He became famous to mainstream country fans when Alan Jackson covered his “Between The Devil And Me” (No. 2 on the Billboard country singles chart, 1997). John and Harley had become buds and co-writers by then. Jackson included their co-write “Meat And Potato Man” on his 2000 Platinum album When Somebody Loves You. John plays and sings the verses and Julie plays acoustic guitar, adds her silken harmonies in the choruses, all the while holding one of their napping daughters in her lap. It’s wonderful to see and hear this joyous performance, which combines so many of the things Julie & John hold dear. North Bay, Julie’s Ontario hometown, is some 200 miles north of Toronto and close to the gigantic Algonquin Provincial Park. Nearby towns have illustrative names like Sturgeon Falls and Trout Creek. “My family was pretty musical,” she says. “My Dad played music and his family played music. He played mandolin and guitar and banjo and he was in a Bluegrass band.” Brothers and cousins were award-winning musicians, and every family get-together included music at a very high level. “As a child,” Julie recalls, “when I was 6, 7, 8 years old, they played Bluegrass festivals in Ontario and toured the East Coast of Canada so I was kind of immersed in that culture.” She loved those adventures. Her Dad and uncles taught her some guitar chords, and the family home – which eventually included nine children and cousins – was a musical treasure trove, with not just Bluegrass but rock and other genres being heard and played. After Julie graduated high school she moved out of town to attend college, but Bluegrass was never far from her heart. A trip home to North Bay found her discovering a desire to play banjo. She now plays guitar, banjo, mandolin, and as of Christmas of 2008, dulcimer. Julie earned a college degree in psychology, and loved working in a neuroscience lab. Her own musical heroes include not just the Bluegrass icons but the Beatles, fellow Canadians Joni Mitchell and Gordon Lightfoot, and Country. She didn’t begin singing that much until she joined her church choir at around 15 years of age. Even now, she and John do special music once each month at their church in East Nashville. While working for the Ontario Provincial Government, Julie decided to take a songwriting class in Toronto. She also began volunteering for the International Bluegrass Music Association (IBMA). At one of the Ontario bluegrass festivals, she happened to meet John Pennell. “Oh yeah, I know those songs!” she said, and happily joined in, not having any idea at that moment that the man who had written them was singing them. Julie then contributed some of her own originals. Her compositions such as “Let The World Slip Away” and “A Thousand Kisses” are now among the duo’s most requested numbers. She has also received several awards for her songs from the Central Canadian Bluegrass Association. The couple kept in touch for a few years before marrying in 2004. John’s boyhood home was the family farm south of the university town of Urbana, Illinois. That’s about 140 miles south of Chicago and 180 northeast of St. Louis, and Pennell will forever be a St. Louis Cardinals fan. The elder Pennell was an upright bass player himself, working square dances with John’s uncle Curt and other friends. Mr. Pennell played several instruments, and encouraged John to play music – but only as a hobby. John’s first instrument was trumpet, which he started playing in school bands in the fifth grade, abandoned, and has recently rediscovered. He went to Southern Illinois University and received a degree in Education. Prior to graduation he fulfilled a student-teacher requirement in Faifield, IL where he befriended the school’s band director, Norman Hills. Norman was an exceptional trumpet player and pianist. John had taught himself guitar, and his band director buddy told Pennell to develop that even further because he obviously saw musical talent there. By the time his father passed when John was 24, he had decided on a musical career. These days, he combines his musical and educational skills by working as a much sought-after private music teacher around town. Not long after his Dad’s death, John returned to SIU, this time to study guitar. By the 1980s, his huge skills had found a major commercial and creative home. John was playing upright bass and guitar in Alison Krauss’s band, in the years before she became a global star. The Pennell and Krauss families had longstanding connections. Alison’s father was John’s high school German teacher, even before she was born. “The songs of mine that Alison has recorded, that’s the whole reason I’m in Nashville,” he says. Shortly after John departed Alison’s band, he met Harley at a festival in New York. Harley’s wife, Debbie Nims, who greatly admired the work of both men, made the introduction. “Man, I heard your stuff. I love it,” Harley told John, who was thrilled because he was at that time a comparative rookie at Bluegrass. Red Allen (1930-93), Harley’s father, was a Kentucky native whose “High, Lonesome Sound” vocals with groups such as the Osborne Brothers, the Kentuckians, and the Allen Brothers remain standards and much loved by Bluegrass aficionados. A visit to Nashville enabled John to visit Harley again. They quickly became friends and co-writers. “The thing that Harley always told me was, `don’t stop writin’ that stuff you wrote for Alison,’ ” John says of his mentor. “Harley was somethin’, man. He seemed to know and understand things about life that belied his years. John and Harley co-wrote more than a dozen songs, including “Meat And Potato Man,” which Keith Stegall produced for Alan Jackson. “Harley was so quick as a writer. If you didn’t have something already written, you had to really scramble,” John says. All The Lonely: A Collection Of Songs By John Pennell, is a remarkably strong and diverse 15-song collection of John’s songs, including several solo compositions and co-writes with Harley, Jeff White, and others. Harley, Mandy Barnett, White, Chris Jones, Kim Parent, Ingrid Graudins and Jeff Allen all shine as vocalists on this recording. Julie & John began working as a duo in 2010. They played clubs and house concerts, and shone at the 7908 Songwriters Festival in Aspen, Colorado, hosted by John Oates of Hall & Oates. By 2012 the pair had two gorgeous little girls and recorded a wondrous, self-titled EP with six original songs, two written by Julie and four by John. Keith Harden and John produced the EP, which shows an evolving sound for Julie & John that will appeal to folks who love Country, Folk, Americana, Bluegrass, Acoustic Rock, and Jazz. Julie’s “Let The World Slip Away” has the same kind of radio-friendly hooks and cherubic vocals that helped make Alison Krauss’s covers of “When You Say Nothing At All” and “Baby, Now That I’ve Found You” such genre-bending crossover radio hits. John’s soulful vocals and Bluegrass influences shine brightly on his compositions such as “It’s Gonna Take A Train,” and all of those who adored Harley Allen’s voice will find influences in Pennell’s own stylings. A bonus track the pair gives us is their version of Paul McCartney’s “Blackbird,” which countless others have tried to cover. Unlike those others, Julie & John truly do it justice, both vocally and musically. The album features contributions from Sam Bush (fiddle & mandolin), Glenn Gibson (dobro), David Talbot (banjo) and Keith Harden (slide-guitar, mandolin & harmony). The EP also showcases another huge gift this couple has – a knack for production. They may have grown up in acoustic music, but they aren’t afraid to add some rock and pop production stylings to these recordings, making for a unique, diverse, and fresh sound that is absolutely their own. The couple is playing, writing, performing, touring, experimenting, using the 25-plus instruments in their music room, and recording some of the tastiest music Nashville is producing these days. Don’t be shocked if they even release some instrumental music in the not too distant future, a new wrinkle for them. Some of that music which may be geared towards TV and film placement. So do yourself a favor. Listen to Julie & John Pennell’s music. See them when they tour. Once you do that, you’ll begin to believe once again that there are great new songs out there, and that Nashville can continue to pleasantly surprise us every once in a mile with music and artists who are really, really magical and really, really meaningful.